Midi-chlorians are a microscopic life form that resides within all living cells. To start with this look back of the Jedi franchise, I have to go all the way back to the beginning and with the very film I never wanted to watch again! I can’t explain the pain and emotion I felt when I left that Cinema way back in 1999! A brand new Star Wars film, the hype that came before it, the smell of anticipation in the air from all those sitting around me. The atmosphere when the final credits rolled was lets just say……..mute and surreal! The Phantom Menace was supposed to be a film that gave all Star Wars fans, a new hope! The franchise which long ended way back in the 80’s was coming back to an established audience and reaching out to a brand new one! Its hard to write a new review of Episode 1 especially since its been an amazing 16 years since it was released. as everything that could possibly be said about the film has been written by better people than me. Its amazing to even now, look around and see the hatred for this very film. Even the die hard fans, have nothing good to say and only those who do say express some nice things, reads like its half hearted and with kindness. One of the most famous quotes I read way back in 1999 a few months after the films release is when a fan strongly wrote “George Lucas has raped my childhood!”. Such a bad use of a word there but it summed up the general feeling that for all those who waited years for this to happen, somehow were now feeling quite angry at the final film! After feeling quite bewildered when I left that cinema on opening night, I realised that I had just watched the worst thing that ever could have happened to a Star Wars film…..that it was rather rubbish. A few months later when it finally emerged on good old VHS, I sat down with hope that now that the excitement and the hype was gone, perhaps the film would come out better in the comfort of my own home? I was wrong again! Once more the film felt wrong, cold and kind of empty and I never wanted to watch the film again, even when Episode 2 and 3 were released a few years later. Now 15 years later and with J.J all set to unleash a brand new episode upon us, it was time to re-visit and hopefully with a now older pair of eyes, The Phantom Menace may not be the disaster I remember! To start with, despite only ever watching this twice and all those years back, it was amazing how much I remembered of the film. From the opening Jedi fight, the ongoing politics, that pod race on Tatooine, to of course the Lightsaber duel at the end, it was like being acquainted with an old friend or foe and to my horror and surprise, it was not the ghastly film I remembered. Perhaps the saying “third time a charm” actually worked on this occasion. Don’t get me wrong, the film still has seriously bad issues and major flaws which made me question many times when watching “What the heck was Lucas thinking?”, but this time I did find a few positives and I will start with them. Firstly no matter how bad the film is, as soon as that theme plays, it brings you back to your childhood and I was quite excited at watching the opening crawl pan up. The film is visually beautiful as well, despite some dodgy CGI moments, but at least in this new version they actually have replaced the puppet Yoda with computer effects, because in the original cut in 1999, he was horrific, especially when you consider how better he looked years before in the original 80’s classics! The Phantom Menace also boasts arguably one of the best moments in the entire franchise and that that is of course the “Duel Of The Fates!”. 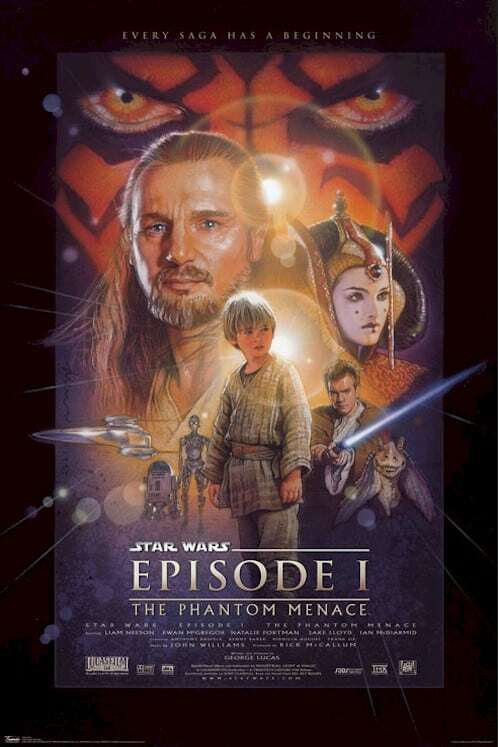 The climatic battle between Qui-Gon Jinn (Liam Neeson), young Obi-Wan Kenobi (Ewan McGregor) and Darth Maul (Ray Park) along with that music score is simply breathtaking and its a shame that the entire scene has somewhat got lost between the all the negativity that surrounds the whole film. Its wonderfully choreographed and filmed and it stands for why we all love Star Wars, because when its this good, its enthralling and thrilling and I did feel a little sad when it ended so easily for Obi-Wan, even though victory came at a cost! The Pod-Race is the scene everyone remembers and while it still rockets and pushes the film up a notch, I did find it go on a bit too long, but again for a set-piece its everything this much loved franchise should be about and if you have little one’s watching for the first time, I bet they be glued and in awe at this Formula One in Space spectacular. Some of the cast need a mention. While Liam Neeson is his usual dependable self, Ewan McGregor channels a young Alec Guinness really well, even though it takes another two films before he really nails the role of Obi-Wan. But the star of the show is no doubt Ian McDiarmid who is clearly relishing being in the limelight after hiding in the dark shadows within the original trilogy. His Senator Palpatine steals every scene and its the only true grasping hook of the entire film which is clearly wrong as this is supposed to be about Anakin and his path to the dark side, which brings me to the negativity of the film! 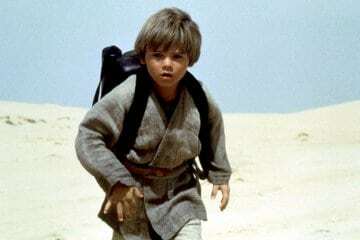 The fundamental flaw is the young Jedi and while the performance of Jake Lloyd as been talked about by many fans over the years, you really can not blame the young actor who is only following a script that is a total wrong set up for a child who is going to become the most feared bad guy in space! Lucas has always stressed that the franchise is aimed for children and its clearly this is what he was thinking when writing this script and to be fair, he does have a point, even though when he offers the same answer to the Jar Jar Binks argument, he does lose my sympathy. If Lucas just thought of the fans who had waited 20 odd years for these prequels and realised that they have grown into adults in between those years, then maybe he would have gone into this at a different angle. When re watching this, I actually could not get Disney’s Aladdin out of mind! How cool would it have been to have seen a street rouge Anakin who loved picking people/aliens pockets and one day tried to steal the lightsaber of a certain Qui-Gon. This is a young streetwise young lad who clearly from the off displays a dark side and is not at full grips with the power of The Force! We also have him the same age as Padame who is clearly intrigued by his carefree attitude, offering her a release from her duties as the Queen. Yes Disney who did not own the rights at the time, may wanted to sue for blatant copyright but lets be honest, how better does that sound to what we actually got served? By having Anakin Skywalker at such a young age may have seemed a good idea to appease the young children watching, especially as they will see a young child in a high octane race and then a space battle, but for fans of old, it ruined the dark essence of the Darth Vader character. I know that his journey had to start somewhere, but did we really need to see him yell the words “Whoopee!” and then having silly little sub plots like he built C3PO…..I mean it it may look good on paper, but it just comes across as unnecessary added material. Also I must not be the only one who found it all uncomfortable at the age difference between Anakin and Queen Padme Amidala. We all know that these two will eventually get it on and she will give birth to the twins Luke and Leia, but with Jake Lloyd only 8 at the time and Natalie Portman an adult at 18, I find it quite wrong that when watching this film that this young Jedi child will one day see her hairy Chewbacca! Really George? I loved Star Wars when I was a child, I was jealous of a young lad in my school who had every figure you could imagine and every playtime we react scenes from the movies, but not once did we ever stop and look at each other and ask “What is the force?”. To hear its about midi-chlorians and listening to Qui-Gon explain it and then we watch as a simple blood test can determine if you are a Jedi or not, is a moment that not only killed this new franchise before it even started, but also robbed a bit of magic from the old trilogy as well and don’t get me started about the whole parentage of Anakin and this prophecy of “He is the chosen one!”…..there was only one film from 1999 that carried that same plot line and the Wachowski brothers along with Neo nailed it better! 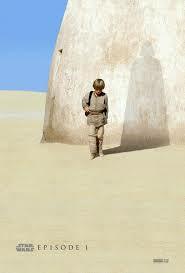 I did notice and chuckle over the scene when Anakin leaves his mother to embark on his new life. Now this was supposed to be the emotional pull which in reality came across quite lame, especially when Anakin seems to forget all about her after five minutes, which recalls the moment in A New Hope when Luke discovers his Uncle Owen and Aunt Beru have been murdered but then simply never mentions them again soon after. He really is his dad after all! As I am coming to the end of this first review I guess I should mention the two characters that dominate most conversations between Star Wars fans…..Jar Jar and Darth Maul. There is not much I can add about the floppy eared Binks that so much venom have been spouted about over the years, the simple fact is, young kids will like him, while us adults with simply hate him and I admit, I still can’t understand a word he says half the time. As for Darth Maul, its still a massive missed opportunity. The potential was there for greatness, such a fantastic design, wasted for what was merely a cameo. The Phantom Menace will never be loved but on the third attempt of watching and a fifteen year breathing space thanks to my hate has served the film well. I did not find it half as boring as I remember and the finale more than makes up for the clunky dialogue and overdrawn scenes. It is defiantly the worst of the franchise but now that all the films that followed are out, I did find myself putting on the Attack Of The Clones straight after, which shows that I required no need for a tiny break from watching what many assume is a disaster of epic proportions. Lucas had to start his story somewhere and its a shame he got it so wrong when the potential was there for a film that could have been a great introduction like in the shape of A New Hope, but have a long dark vibe that served The Empire Strikes Back so well. The end result is a film that strains to fulfil its legacy of its past, failing to appease the die-hard fans, while alienating a whole new generation. If Episode 1 was released way back in 1977 instead of Episode IV, I very much doubt the love of this franchise would be as strong or as successful. Put it this way…...Phantom Menace has a 2hr running time but only two scenes of note that Star Wars deserves, yet it does contain more fart jokes which basically tells you the level we are at! The movie posters back then pointed out, “Every Story has a beginning”, and that is off course right! Its just a shame that Lucas forgot that the middle and end of the story which was rich full of action and twists is the very reason we the fans were back at the very start, to see it all unfold. Episode 1 was supposed to be dark, not friendly with added E.T Cameos, and while its not half as bad as I remember, its still not a very good film. I don’t look back now and see an awful film but a massive missed opportunity which in some ways is even worse, but having just watched Attack Of The Clones while writing this review, I am amazed to say that the Star Wars prequels would get a lot worse before they get better…. 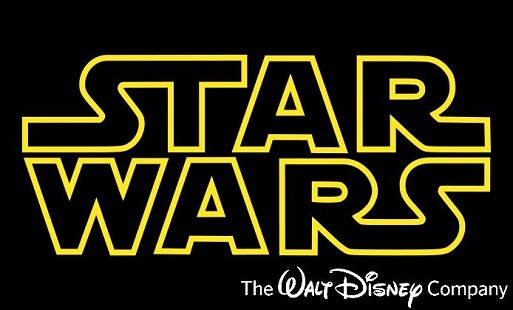 So, who the hell will direct ‘Star Wars: Episode VII’? 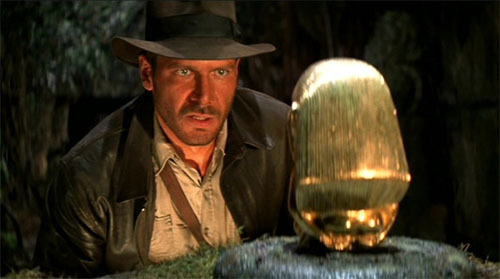 Raiders of the Lost Ark is released for an exclusive one-week engagement in select IMAX cinemas on 21st September!